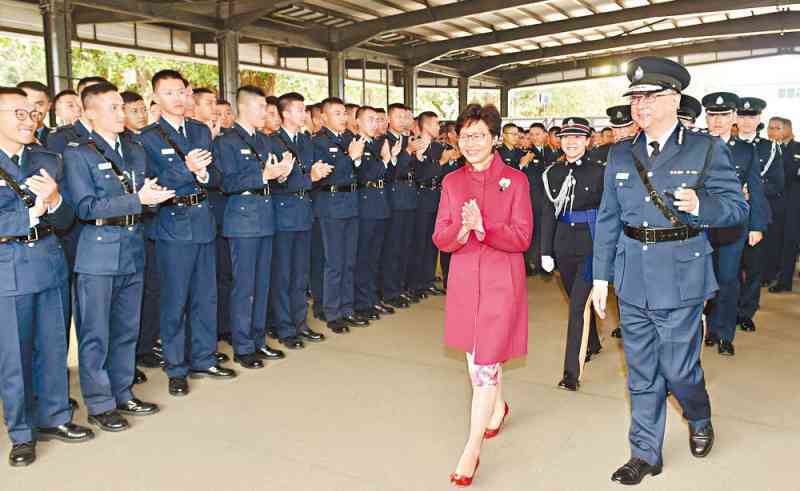 Chief Executive Mrs Carrie Lam praised the Police Force for maintaining Hong Kong's rule of law, integrity and law and order as well as making a significant contribution to the economic development of the city. 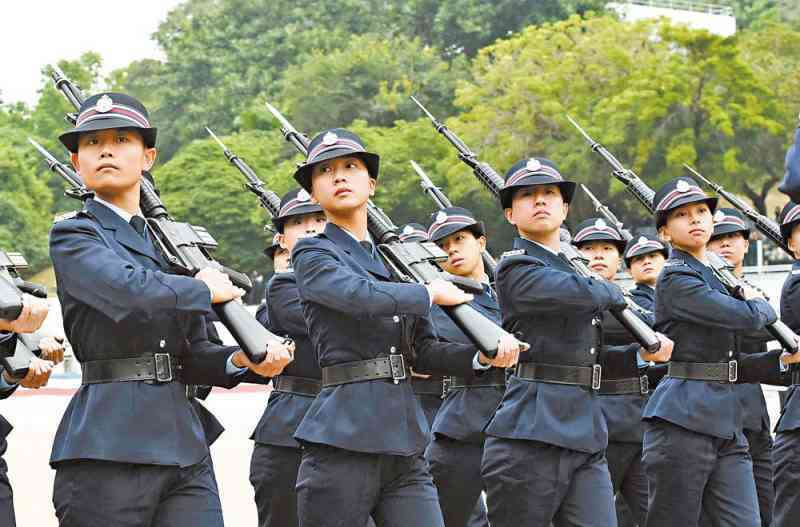 She made the remarks after inspecting a passing-out parade of the Police College on November 25. Speaking at the ceremony, Mrs Lam said that the number of crime cases per 100 000 population in Hong Kong for 2016 stood at 825, representing a new low in the past 44 years. This was attributed to the concerted efforts of the disciplined forces in safeguarding public order. She was glad to know that while the crime rate was on a downward trend, there has been an increasing number of people applying to join the Force. In 2016-17, the number of applications exceeded 21 000. Mrs Lam was of the view that an outstanding police force has to keep abreast of time and strive for excellence. She commended the Force for being innovative and seeking breakthroughs and improvements continuously over the years. Taking technology-related crimes as an example, the Force noted with foresight that this type of crime would burgeon and become prevalent and thus has taken the initiative to establish a dedicated team to handle online crimes. In addition, in view of the spread of global terrorism, the Force has set up a team within a short period of time to ensure that Hong Kong remains one of the safest cities in the world. The Chief Executive also noticed other aspects of the Force's work, including the use of social media to disseminate messages of the Force and local safety situation so as to enhance communication with the community. She noted that the Force cared for the community and launched initiatives such as "Project Himalaya" and "Project Gemstone" to assist ethnic minorities to integrate into society. Some of the ethnic minority participants were aspired to join the Force afterwards. 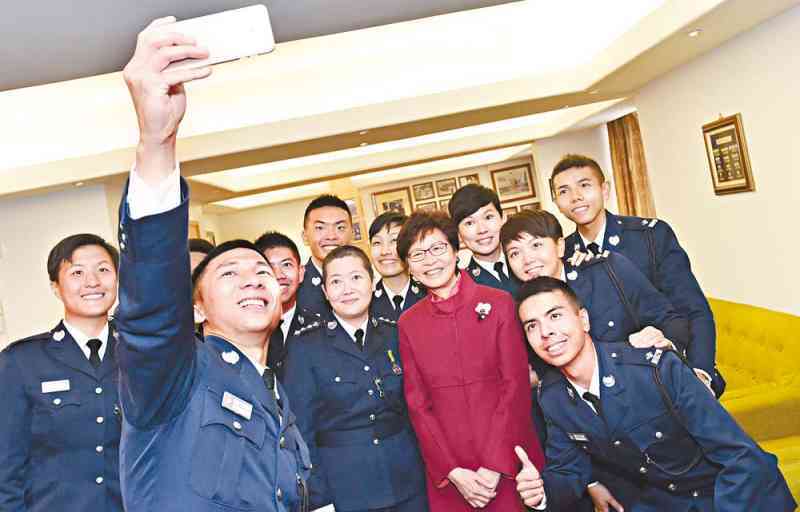 On youth engagement, the Junior Police Call (JPC) grew along with Hong Kong people. The JPC@Pat Heung was commissioned in August this year, benefiting more young people. Mrs Lam encouraged the graduates to work with commitment and passion, and to serve society and members of the public with empathy. She urged every graduate to live up to the principle of "We Care, We Listen, We Act". Meanwhile, she hoped that all Force members would continue to work together to maintain their professional standards. A total of 40 probationary inspectors (PIs) and 176 recruit police constables (RPCs) graduated on that day.